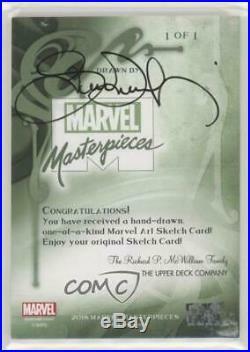 2018 Upper Deck Marvel Masterpieces – Sketch Cards #SKT Simone Bianchi. COMC Item: 62936929 – Non-Sports Card. Featuring Simone Bianchi. Search for more: 2018 Upper Deck Marvel Masterpieces. 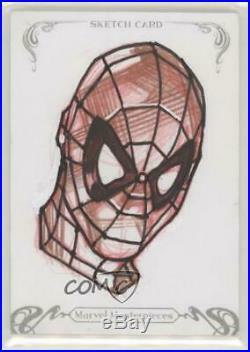 Search for more: 2018 Upper Deck Marvel Masterpieces – Sketch Cards. Q: Is that a stock photo? Those are images of the actual item you will receive. Q: What does the “b6e” in the title mean? A: At COMC, we scan the front and back of every item that is consigned with us. The “b6e” helps us differentiate the listings in order to ensure you get the actual item pictured. Every consignor is assigned a code. All listings with “b6e” are owned by the same COMC consignor. Search for more listings from COMC consignor b6e. Located in Redmond, Washington, COMC (Check out My Cards) is the leading online marketplace for trading card singles. We currently house more than 17 million cards, each listed for sale with front and back images of the actual card. You may return a product within 30 days of receiving your item. 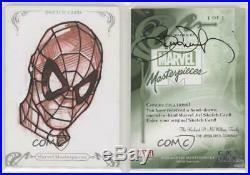 The item “2018 Upper Deck Marvel Masterpieces Sketch Cards #SKT Simone Bianchi Auto b6e” is in sale since Friday, March 22, 2019. This item is in the category “Collectibles\Non-Sport Trading Cards\Trading Card Singles”. The seller is “comc_consignment” and is located in Redmond, Washington. This item can be shipped to United States, Canada, United Kingdom, Denmark, Romania, Slovakia, Bulgaria, Czech republic, Finland, Hungary, Latvia, Lithuania, Malta, Estonia, Australia, Greece, Portugal, Cyprus, Slovenia, Japan, China, Sweden, South Korea, Indonesia, Taiwan, South africa, Thailand, Belgium, France, Hong Kong, Ireland, Netherlands, Poland, Spain, Italy, Germany, Austria, Bahamas, Israel, Mexico, New Zealand, Singapore, Switzerland, Norway, Saudi arabia, United arab emirates, Qatar, Kuwait, Bahrain, Croatia, Malaysia, Brazil, Colombia, Panama, Jamaica, Barbados, Bangladesh, Bermuda, Brunei darussalam, Bolivia, Ecuador, Egypt, French guiana, Guernsey, Gibraltar, Guadeloupe, Iceland, Jersey, Jordan, Cambodia, Cayman islands, Liechtenstein, Sri lanka, Luxembourg, Monaco, Macao, Martinique, Maldives, Nicaragua, Oman, Peru, Pakistan, Paraguay, Reunion, Viet nam, Uruguay.